For many years, the GeoSwath system from Kongsberg GeoAcoustics has been providing an efficient simultaneous swath bathymetry and sidescan seabed mapping solution with accuracies that meet the IHO S-44 Special Order standard for hydrographic surveys. GeoSwath systems have been fitted to a number of small crafts and have been utilised to conduct bathymetric surveys of lakes, ponds, dams and rivers. This article describes two of the vessels that have been employed to undertake this area of work. The use of Unmanned Surface Vessel (USVs) allows surveying in locations and situations in which deployment of conventional platforms is not practical or safe such as mine tailings ponds or remote locations where access for traditional vessels is difficult or restricted. Kongsberg have been supplying USVs integrated with a modified GeoSwath system for the last couple of years. The vessels used to date have included the EchoBoat-ASV (Seafloor Systems) and the Z-Boat 1800 (Teledyne Marine). 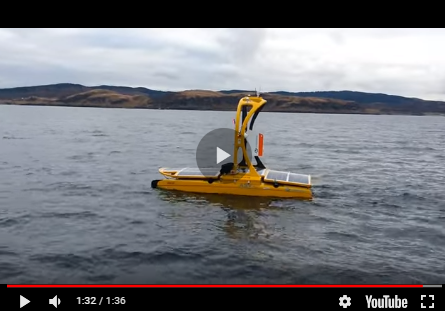 The GeoSwath system installed in the USV is based on the unit designed for use in the Remus 100 Autonomous Underwater Vehicle (AUV) manufactured by Hydroid Inc. The complete GeoSwath USV system comprises a remotely controlled hydrographic survey boat that is fully integrated with a GeoSwath system, GPS position & heading sensor, a motion reference unit (MRU) and a sound velocity sensor. In the case of the Echo-Boat ASV, a Futaba 2.4GHz omni-directional antenna provides remote control of the vessel with a claimed range of up to 2km. Within the USV, the GeoSwath module comprises an industrial PC that runs the GeoSwath data acquisition software and controls the sonar electronics. The GeoSwath module onboard the USV is connected via a radio LAN modem link (100Mbps) to a shore-based PC that also runs a version of the GeoSwath GS4 software. This modem link allows control commands to be sent from the shore-based version of the GS4 software to the GS4 software running on the GeoSwath USV module to control the data-acquisition settings. This link also allows sonar data as well as data from the GPS compass, MRU and SVS to be transmitted back to the shore-based PC and displayed within the GeoSwath GS4 software. The position and heading information of the USV is displayed in a window within the shore-based GS4 software so that the operator can see where the USV is in relation to a predetermined survey plan. The GeoSwath USV module saves all of the raw data files to a local hard disk drive in a propriety .rff format. These raw data files can be subsequently processed using the GS4 software. The following is a case study of a survey conducted on a shallow lake using one such system, which was based upon a Seafloor Systems EchoBoat fitted with a SeaPath 134 GPS/MRU. Sound velocity is measured using a Valeport MiniSVS that is fitted to the transducer head below the vessel. The EchoBoat is constructed from UV resistant HDPE and measures 1.68m by 0.81m. System power is provided by 2 independent supplies, one for the vessel and one for the GeoSwath system and ancillary equipment. The USV will run for up to 8 hours of operation depending upon speed and environmental conditions, a single battery pack will give up to 2 hrs GeoSwath operation and this can be extended with additional battery capacity. Figure 1: The USV in action on the lake near Reading. The USV was used to survey an old gravel pit south of Reading that was being redeveloped into an ornamental lake as part of a new housing development and the developers required a hydrographic survey of the lake. The lake was approximately 150m at its widest point and approximately 300m long. A base station was set up on the side of the lake and used to control the USV as it conducted the survey. The USV was launched by 2 persons from the bank of the lake using a launch trolley, and recovered in a similar manner. The traditional method of surveying such a lake would have been to deploy a small vessel and conduct a survey using a single beam echo sounder to get spot depth measurements and use a depth pole to generate spot data towards the banks of the lake. The entire survey took less than an hour to complete, which was considerably less time than the alternative method of a boat and pole, and gave more complete coverage than would have been possible. Once the survey had been completed the data was processed using the GS4 software to generate an XYZ plot of the bathymetry for presentation to the client with a 0.5m grid spacing. Figure 2: Bathymetry of the lake near Reading. The majority of the lake ha a flat bottom with 2m depth. Most of the lake is about 2m deep with a deeper 4m channel in the north-east corner. Due to the swath width of 20m (10x water depth) the entire survey was completed in just a few survey lines being run. As well as the bathymetric data recorded, the GeoSwath system also recorded co-registered geo-referenced side-scan data. There are occasions where remote control of a USV is not practical or desirable given the potential size of a survey area, the distance from a base station for communications or the distance from a potential launch site. In order to address these situations, Kongsberg GeoAcoustics have recently launched their Compact Survey Vessel (CSV). The CSV has been specifically designed to survey shallow coastal and inland waterways quickly. Kongsberg GeoAcoustics have combined a powerful and manoeuvrable two-person catamaran (manufactured by Zego Sport Boat, New Zealand) and have equipped it with the latest GeoSwath 4R system. The GS4R is similar to the system used previously in the USV deployment except that the sonar electronics and control PC are housed in a ruggedised enclosure that is connected in turn to a control PC via an Ethernet link. This control PC runs the GS4 software and is accessed from the helmsman’s position. Figure 3: The Compact Survey Vessel (CSV) shown here fitted with a Seatex SeaPath 134 GPS compass and MRU. The CSV is a lightweight two-person catamaran and due to its lightweight is easily transportable on its trailer so that launch and recovery can be made from small slipways or straight from the shoreline. The craft is light enough to be launched by one person, and all the instrument controls, communication systems and survey operating tools are ergonomically designed so that everything can be accessed from the helmsman’s position. Fitted to the CSV is a ruggedised laptop, which is used to control the data acquisition through the dedicated GeoSwath 4R software package. An external keypad is provided that has been configured to enable the user to easily start and stop data acquisition without using the laptop’s keyboard. The vessel is constructed from plastic with all stainless steel fittings. It measures 3m in length, has a width of 1.62m and weighs 182kg, which includes the supplied 30HP outboard engine. Based on the engine manufacturers fuel consumption data, the CSV will use approximately 4l/h at survey speed. Standard fuel capacity is 24l, which gives the Compact Survey Vessel the ability to operate for approximately 6 hours before the need to refuel. With a top speed of 27 knots it can quickly get from launch site to survey area, although at higher speeds fuel consumption is greatly increased. At 5,500rpm the 30HP engine uses 13L/h. Figure 4: 3D plot of the bathymetry of part of the west dam wall at Draycote Water. Colour scaling is from the surface down to 17.5m. The vessel has a draft of just 0.35m so it can operate in extreme shallow environments. One of the key advantages of the GeoSwath system is its ability to image a swath up to 12 times the water depth, which in just 35 centimetres of water gives a swath of over 4m wide at survey speed. The actual width of the swath achieved is dependent upon a number of factors such as the bottom material and the material’s acoustic absorption characteristics. The GeoSwath transducer is mounted on a retractable pole with a pre-installed motion reference unit (Seatex) and sound velocity sensor (Valeport MiniSVS). The standard vessel is also fitted with a Seapath 134 GPS heading and position system (although other options are available). The GeoSwath system is pre-calibrated in terms of sensor offsets of GPS compass and MRU so that the survey operation can commence immediately on arrival, and no time is wasted running additional survey lines. If the surveyor wishes to run additional calibration lines then these can be done and the data checked to confirm that latency, pith, roll and yaw settings are correct within the GS4 software prior to processing the recorded data. Draycote Water reservoir was completed in 1972 and supplied drinking water to the town of Rugby and the surrounding area. It has a surface area of approximately 2.4km2 and holds 22.7Mm3 of water with a maximum depth of 19m. The site was originally chosen as the land was low lying and was surrounded by 5 small hills and a ridge that were linked together by 6 dams to form the reservoir. The CSV was used to survey an area (700m x 300m) adjacent to the dam wall on the west side of the reservoir in less than an hour. The maximum depth measured in this area was 17.5m and the output provided to the client was in an XYZ format with a 0.5m grid spacing. Figure 5: Co-registered geo-referenced side-scan data for the area adjacent to the dam wall. By capturing side-scan images at the same time it is possible to extract additional information through subsequent processing such as material classification and texture analysis. The use of bathymetric measurement systems fitted to small vessels such as the GeoSwath USV and CSV offers the potential of conducting more complete surveys and in locations that would have previously been too difficult or too time consuming to undertake. Each of these vessels have been designed to address a particular need in surveying inland lakes, rivers and dams. The use of USVs addresses some of the health and safety issues raised with having people operating on water bodies that could be potentially hazardous. Improvements in battery capacity combined with autonomous control systems will allow longer duration missions in the future with less input required from the surveyor. A number of jurisdictions and organisations around the world are starting to think about the legal implications of USVs and how much final control from the ‘human element’ should be included. The CSV is a vessel which helps bridge the gap of surveying larger bodies of water or longer rivers where it may not be practical to set up a number of shore-based stations or where the site is too restrictive for the use of a conventional survey vessel.